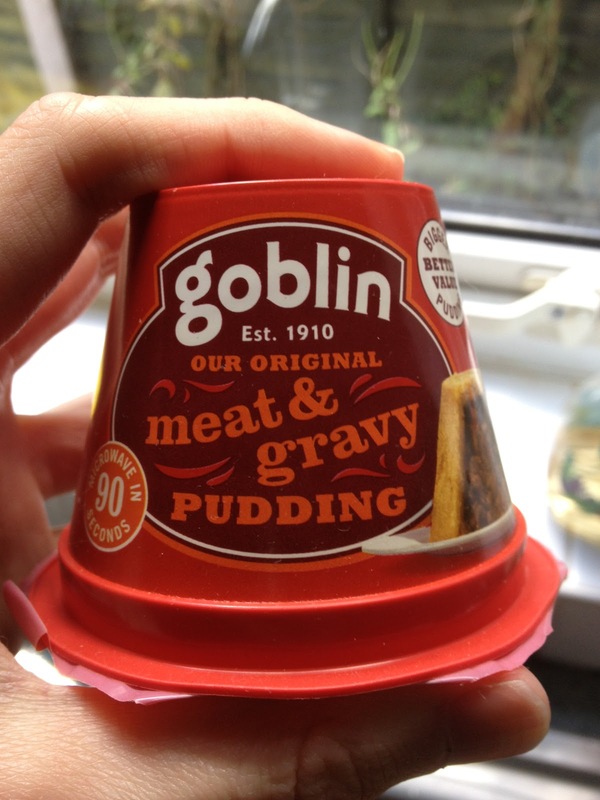 Note - this product doesn't contain goblin meat - that's just the manufacturer's name. Once in a while I spot a product so disturbingly unlikely that I have to try it. This is essentially a pie, that you microwave, that comes in a little plastic pot with a far-away BBE date. It's a convenience lunch for sure, but it it one that any sane person should be bothering with. Pies usually have advice on them saying not to microwave as the pastry goes wrong. This actively encourages it, and describes itself as a pudding instead to point out that it's squishy and almost suety instead of crispy and nice like a Pieminister should be. It also seems to contain the smallest particles of meat instead of the big lovely chunks and luxurious flavours we all love. It required a bit of *persuasion* to get it out of the little pot - maybe this is our dodgy old microwave that has a dial instead of digital buttons. The smell was actually pretty appetising, my primal brain wanted to eat this - whatever it was! Aside: If you ever had school meals in the 80s in the UK then you will be familiar with certain odd flavours and textures that we just don't get any more. Some days these went horribly wrong - maybe you were on first sitting and they were undercooked, maybe you got there late and it was brown mush. Once in a blue moon the dinner-ladies were in alignment and the light streamed in from the high, victorian windows at the correct angle and the unthinkable happened - your school meal was edible and enjoyable. This happened more in the 90s due to prepackaged stuff (and as schools pretended that optional healthy food was enough of an excuse to let you eat fish-fingers, chips and beans every day of secondary school like I did), but at infants and junior school it was a moment to savour. This funny little pot is like the best school dinner you ever ate. The flavour is all meat and no fuss, and yet still tastes like the olden-days. The texture of the pudding bit is completely wrong, it doesn't tear apart like good food should. Its a bit rubbery and its probably not that nutritionally valuable, but you will eat the whole thing and you will smile. Now don't get me wrong - this isn't even slightly good food! It's less than a pound for one of these little guys and even as a lunch I was hungry shortly after. And anyone who is offered the choice between this and a PieMinister and chooses the Goblin should probably be sent back for a second try at school. This is something you will buy and then forget you own. It will sit there in the cupboard until you need a lunch, or a snack that takes no mental or physical effort. You will microwave it, and then free it from its little red pot, and with one bite you will be 8 years old again. You should have followed it up with a Pot Noodle as main course and washed down with some Red Bull! I tried the steak and kidney variety once. I thought it was honestly one of the worst things I've ever tasted. Never again. Their Stewed Steak shows up fairly regularly in Poundshops. For Uni students, skint after spending their parent's allowance on booze the night before, it's probably better than nuffin'. That dinner lady experience whilst nursing a bad hangover seems strangely comforting in an odd way.